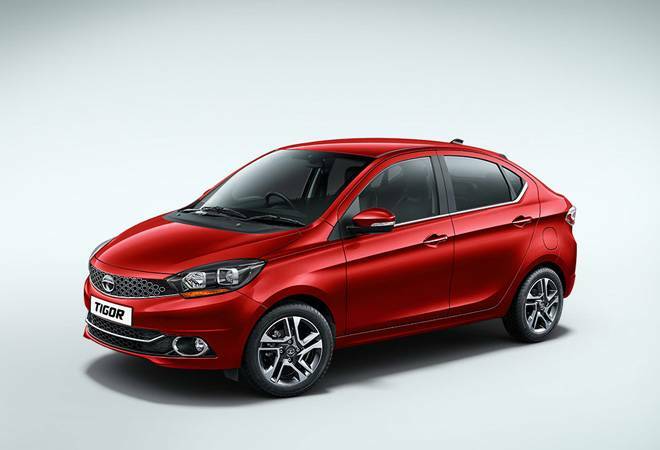 Homegrown auto major Tata Motors on Wednesday launched a facelift version of its compact sedan Tigor at Rs 5.27-6.49 lakh for the four petrol variants and Rs 6.09-7.38 lakh for the four diesel versions. Tigor is also offered in an automatic manual transmission version with the petrol engine that is priced at Rs 6.65 lakh. Tigor is the third new model to be launched in the highly competitive compact sedan segment following the launches of the new Honda Amaze earlier this week and the Ford Aspire just last week. Buoyed by the successes of its compact hatchback Tiago, on which the Tigor is based, and its compact SUV Nexon, Tata Motors has outpaced the market for 32 straight months so far. In the first half of the year, its volumes in the domestic market have grown by 32 per cent while industry volumes have declined by over 3 per cent. In the second quarter of the year, the company was the only car maker to register a growth in sales. "The compact sedan segment has been an important space for the customers seeking premium-ness at best value coupled with bold and attractive looks. Connecting the aspirations of these customers, we are excited to introduce the new Tigor. Loaded with class above features, this car is the result of a perfect combination of beautiful craftsmanship, performance, comfort and technology. I am confident that the new Tigor will create a positive excitement to the brand fostering the ongoing PV growth journey." said Guenter Butschek, CEO and MD, Tata Motors. The car is powered by a 1.2 litre Revotron petrol engine that produces 84 bhp power at 6000 rpm and 114 NM peak torque at 3500 rpm. The diesel engine is a 1.05 litre powertrain that belts out 69 bhp at 4000 rpm and 140 NM torque at 1800-3000 rpm. The car offers height adjustable driver's seat as standard feature for the perfect driving position, scooped out front seat backs for more legroom, class leading head and elbow room for the rear passengers. It also comes equipped with a fully automatic temperature control (FATC) with uniform cooling all around the cabin, a boot space of 419 ltrs with wide and clear opening using an innovative 4 bar mechanism and 24 intelligent spaces for carrying a lot more on the move. With a 7" capacitive infotainment with Android Auto from Harman, the new Tigor comes equipped with 4 speakers and 4 tweeters, helping provide its cabin inmates with an exemplary surround sound experience. Every detail of the sound system has been precisely tuned by Harman golden ear certified auto experts to maximise the interior acoustics of each specific cabin, taking a leap towards auditory perfection and setting new standards for the ultimate in-cabin listening pleasure.